Fruit and vegetable juicers have been mechanized for a number of decades, but it is lesser known fact that grinding and extracting the juices, the way these blades and filters do, might result in loss of its nutritional value. There is science and there is a technology that aims to improve our life, keeping this science as its constraint. The quality of material used for storing and expelling the liquid out of the product is important. The Omega NC800HDS Nutrition System is one such equipment that takes care of the science. The key idea is a “low speed” juicing system. Yes, that is right, although it might seem unnatural because it will take more time than a faster machine. That is the reason why Omega NC800HDS Nutrition System is one of the healthiest juicers on the market. This is attributed to the technology called as “masticating” and this particular series of juicers from an Omega fall in the category of “Masticating Juicer”. This maintains a slower speed of about 80 RPM to slowly crush and grind the item, whether a fruit or something tougher like a wheatgrass. The idea is quite relevant because this slow grinding reduces the heat generated in the machine and in the product, which avoids any oxidation of the liquid being expunged out of the item. In case of lighter and thinner liquids this is even more crucial since a higher viscous or thick juice will tend to less oxidize with the heat generated during the grinding and crushing. This is complemented by an auger system that simultaneously forces the liquid or the product into a tight storage container where it is pressed to release the juice from the items. The Omega NC800HDS Nutrition System is comprised of selected motors, gears, electrical and electronic systems along with the material used for the containers and overall body. The chassis consists of a gear reduction equivalent to a 2 HP motor that maintains the speed of 80 RPM during the juicing process. This helps it obtain a power rating of 150 Watts. A low powered juicer is meant to be energy efficient and power saver for the monthly utility bills. The overall body has a fine silver finish with black accents that looks really tempting and can easily mingle in any kitchen surrounding and with other home appliances. The dimensions are 6.5 x 14.5 x 15.5 inches and this is a crucially compact form factor that enhances its ability for storage in your kitchen. It does not take up much space and is also lightweight at 13 lbs which is just like two laptops without their adaptors. This really makes it easier to carry around and use it in your garden, patio house and elsewhere. The complete specification sheet is available for download on their official website that further lists all of the above with additional details for technical experts. This is to help make an informed decision before your purchase. The Omega NC800HDS Nutrition System is a whole bunch of carefully designed devices. The main aim of keeping it masticating and properly balanced in speed and power makes it a nutrition system. There are other benefits that make is a real killer for any kitchen juicer. Now, the best part is the Extremely Quiet Operation. This is what makes it an ideal companion in your kitchen where you can enjoy your television program and make your juice at the same time. The Omega NC800HDS Nutrition System is one of a kind in its manufacturing and choice of mechanisms. It has been awarded with prestigious UL or Underwriters laboratories Household Approval. UL is an independent laboratory that checks, reviews and destroys every product to drastically check its durability, manufacturing defects, applications and convenience before approving it for its intended use. This product has been one of the best-selling juicers, for both fruits and leafy vegetables, on Amazon for a long time and you must find a lot of reviews and comments to help you with your doubt and clarifications. 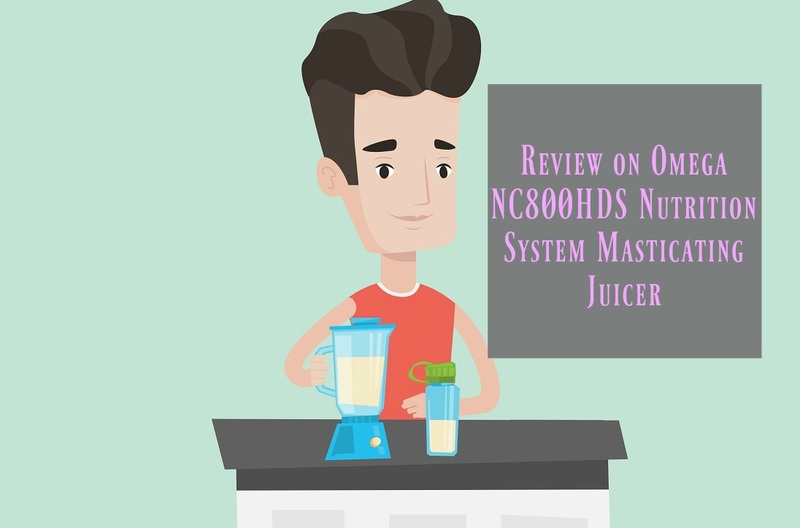 Omega Nc800HDS Nutrition System is a promising juicer with some novel technologies that makes it a healthier alternative compared to other relatively expensive products in the market. It has a good set of features and a well-balanced design that meets the requirements of any household.